Only 64 companies from the original S&P 500 are still listed on the index, and one forecast predicts that an additional 50 percent will be replaced over the next 10 years. The pace of this churn is expected to increase due to a combination of forces: digitization of information, storage of that information, and communication networks to move data around. 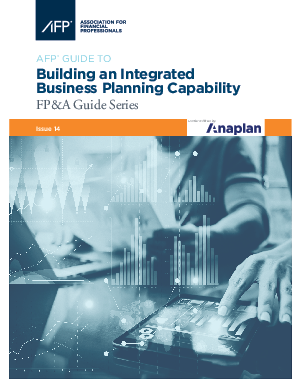 The latest installment in AFP’s FP&A Guide Series, Building an Integrated Business Planning Capability, can help your business rise above the average. In it, AFP breaks down the complexity of IBP into components and provides some tactical shifts you can make today.